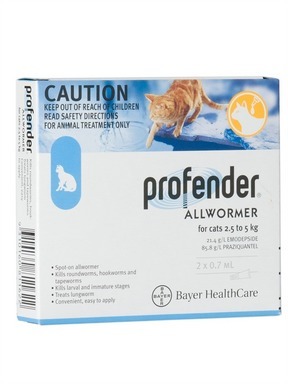 Profender Allwormer is the only treatment your cat will ever need for feline roundworms, hookworms and tapeworms. Profender is a complete intestinal wormer for cats, without the fuss of oral dosing. It is available in different color-coded pack sizes to make it easy to treat felines of all shapes and sizes accurately: blue for cats 2.5 - 5 kg (5.5 - 11 lbs) and red for cats 5 - 8 kg (11 - 17.6 lbs). Twist the cap and remove this from the tube. Press the underside of the cap onto the top of the tube to break seal. Part the cat’s fur on its neck, at the base of its head. Apply the contents of tube directly onto the exposed skin. Squeeze the tube several times to release all of the solution. Treat kittens at 8 and 12 weeks of age, and thereafter repeat treatments at three-monthly intervals from then on, or as otherwise directed by your veterinarian. Female breeding cats should also be treated at mating, then before kittening.